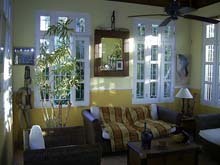 House with private swimming-pool/Garden/BBQ, at 50 meters from the Beach. 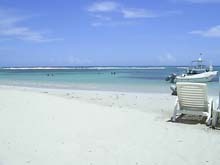 Ideal for people wishing to relax and enjoy the scenery at the edge of the Caribbean Sea near the capital Santo Domingo. Guayacanes is from 15 km las americas airport, 40 km from Santo Domingo, 17 km from san pedro de macoris with motorways and 2 km before Juan Dolio. 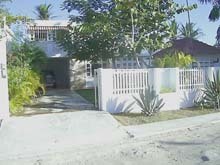 This fact that the village retains its authenticity and its tranquility.Restaurants and all locals dominicans, groceries,pharmacy,bus, etc... Around 100 meters. Washer/Dryer, Linens Included, Air Conditioning, Pool, Equipped Kitchen, Stove/Oven, Microwave, Coffemaker, Cooking Utensils Provided, BBQ Grill, Cable TV, TV(broadcast), CD Player, Stereo, DVD Player, Telephone,Private-Pool; internet dial-up with computer. ALL LOADS INCLUDED + Morning House maid cleaning monday to friday INCLUDED and maintenance pool/garden every morning. Price, 1000 usd/week. Reservation: 30% ( Bank to bank, or Moneygram ),Sold 2 weeks before you arrived ( Bank to bank, or Moneygram ),OR in cash the day you arrived. Deposit 400 usd in cash the day you arrived ( refunded in cash he day you go ). Degressive price within 2 weeks rentals.